Improvements to how Records are Exported to external accounting packages including support for more MYOB versions and continued Xero Integration. The address book now has a direct link to Xero Contact ID's. The option to save searches has been added to the Invoice Module and a new Job Number column is now available. If more job information is needed simply hover over the job number to see the job name. Search for unexported invoices using Invoice Advanced Search. Note: This option can also be used via the Accounts Export Invoice Pop Up. 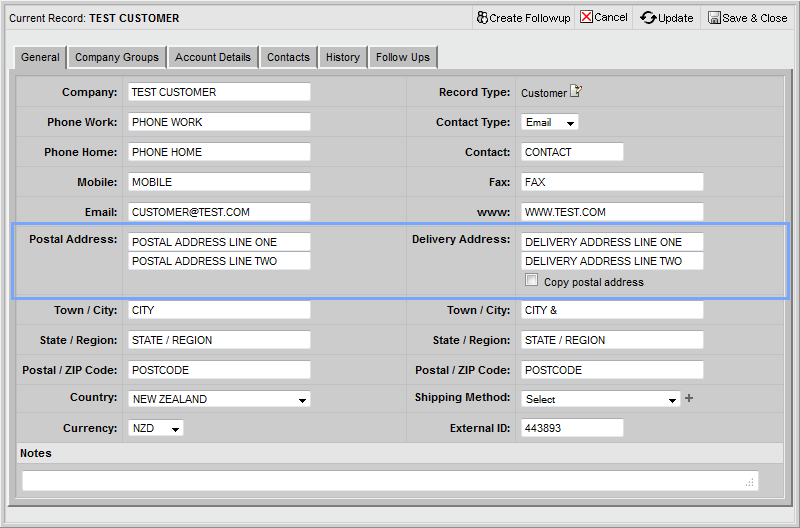 The three grey shaded address lines have now been removed from the Companies Module General Tab. To avoid creating blank timesheets a compulsory "update timesheet" step was added when scrolling through the date field. This has now been changed to a configuration setting so if this is not required it can be disabled. When changing timesheet dates is now option if a submit is required or a new entry automatically created on that date if there is not one. When there are no matches found for a customer or supplier a record can quickly be created directly from the module for those with permission/access. This is available where ever a link to customer or supplier is available. A new configuration is now available to display more information to the user when timesheets are being added to tasks. There is now a date field next to Account status. This will allow you to set when approved suppliers records have expired. A report is available to make it easy to chase suppliers for updated records.